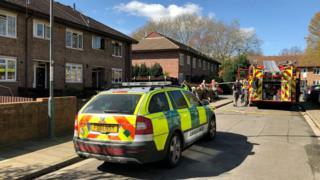 A house fire which killed an elderly woman was caused by a cigarette that was not fully put out, the fire service said. The 78-year-old, who has not been named, died in the blaze on Mundy Street, in Derby, on Monday morning. A Derbyshire Fire and Rescue Service investigation concluded the most likely cause of the blaze was accidental due to "smoking materials". A man was also taken to hospital for minor burns and smoke inhalation. The fire service said it believed the blaze started in a bedroom. It has now urged smokers to ensure their cigarettes are fully extinguished and never to smoke while in bed.